By Jeff Aranow: Trainer Angel Garcia claims that his son Danny Garcia (33-1, 19 KOs) is the 3rd biggest cash cow in boxig, behind only Floyd Mayweather Jr. and Manny Pacquiao. Angel places Danny Garcia above middleweight Saul Canelo Alvarez and heavyweight champion Anthony Joshua for some reason despite him not being a pay-per-view fighter. Garcia, 29, lost his last fight against WBA welterweight champion Keith “One Time” Thurman on March 4 of this year. 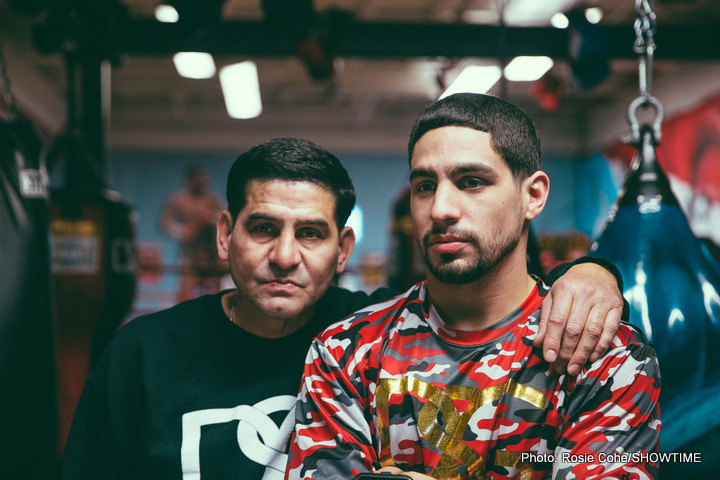 “All these guys with belts are like with trophies,” said Angel Garcia to Fighthub. “There ain’t nothing wrong with having a trophy, but these guys aren’t making money. The cash cows is Floyd Mayweather, Manny Pacman and Danny Garcia. These are the 3 cash cows right now. The biggest cash cow is Floyd. The 2nd biggest cash cow is Manny. The third biggest cash cow is Danny Garcia,” said Angel. Maybe Angel knows something I don’t about Danny Garcia in terms of the money he brings in for his fights on Showtime Boxing. However, Garcia can’t possibly be raking in the kind of dough that Canelo and Joshua are bringing in with their fights on PPV. Canelo is a big star on HBO, and his fights have been continually televised on pay-per-view for that network since he signed with them a couple of years ago. Garcia is yet to headline his own pay-per-view fight. Garcia could potentially become the 3rd biggest cash cow in boxing, but it’ll require for him and his manager to change the way he’s being matched. Garcia’s problem is he’s not been fighting the right opposition for the last 10 years for him to become a star. Since turning pro in 2007, Garcia has largely been carefully matched by his management. They’ve tended to match Garcia against guys that he can beat for the most part instead of putting him in with a lot of risky fighters. Recently, Garcia was called out by IBF welterweight champion Errol Spence Jr., who offered to defend his title against him. Garcia has said nothing about wanting to fight Spence. Shawn Porter was also interested in fighting Garcia. That’s another fight that didn’t get made for lack of interest on Garcia’s part. Instead, there are rumors that Garcia could fight Brandon Rios next. Match-making like that is clearly holding Garcia back from becoming a PPV star in boxing in my opinion. For Garcia to become a huge star, he’s going to need to be able to fight guys like Spence, Porter, as well as top guys from the 154 lb. division like Jermell Charlo. If Garcia can take on those type of fighters and beat them, he’ll increase his star power. I just don’t see Garcia doing that. Of those fighters, only Thurman is a super talented fighter. The rest of the guys are mere contenders. Salka and Malignaggi were really bad choices for Garcia to be taking at this point in his career. Garcia should have spoken up when his management mentioned Malignaggi and Salka, but it looks like he didn’t.